When you install the app you need to accept the charge. However, you will not be charged until the trial period expires (this is how the Shopify standard trial model works). If you uninstall the app before the trial period ends, you will not be charged. 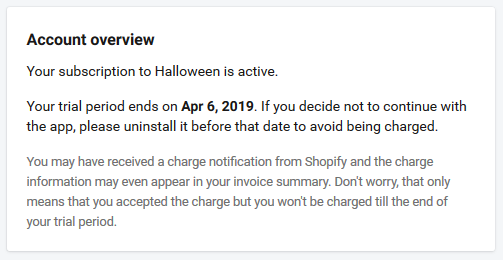 You may also receive a notification email from Shopify about your payment. Don't worry, that means that the payment has been approved, but you will not be charged until the trial period ends. Please note that payments are managed directly by Shopify. It is Shopify, and not us, who charges you, and then transfers our part to us. For that reason, we cannot create or refund charges or control the billing cycle. We do not have access to your payment data either.